The watch draws inspiration from the exploits of King Arthur’s knights, the high end Geneva Manufacture has created a series of 88 exceptional pieces distinguished by their boldness and steeped in history. Twelve knights of the round table armed with their faithful swords, have been cast in gold to form a perfect circle around a stunning dial in grand feu enamel. Underneath the ‘table’ is housed the RD821 movement. 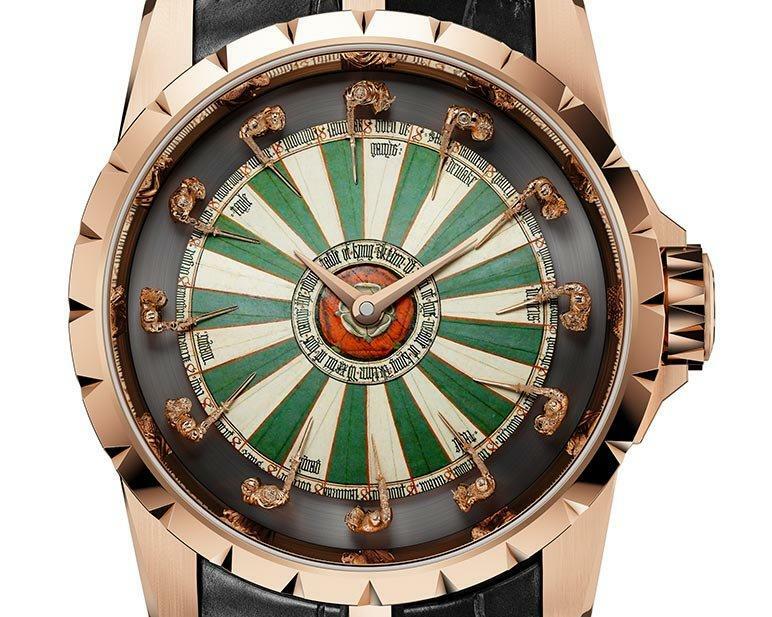 Fittingly, from a manufacture who creates what are regarded among connoisseurs as grail watches, with this new model he pays tribute to those that went in a quest for the Holy Grail. 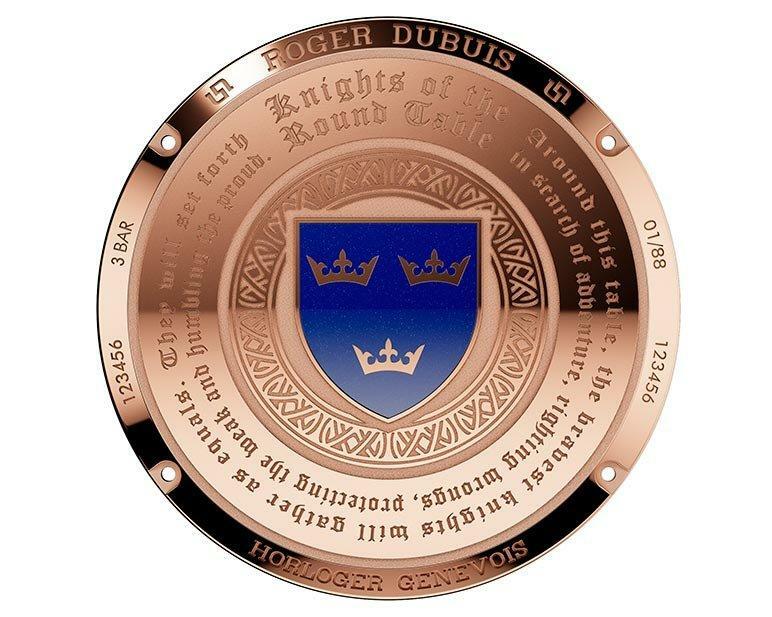 Roger Dubuis designers took as their guide the reproduction of the Round Table made for Henry VIII and placed in the Grand Hall of his castle at Winchester. What makes the legend so popular is that the adventures of the kingdom of Camelot are universal. King Arthur valiantly defends his realm from his enemies. The best, the noblest and the purest of men were at his side in combat, companions whose strength of arm was equalled only by their strength of character. As the legend goes, the noble knights were an adventurous lot, a latter day 'A Team', righting wrongs, protecting the weak, and humbling the proud. The watch is produced in a limited series of 88 pieces, with its 45 mm case in pink gold the watch respects the design codes of the Excalibur collection: over-sized case, fluted bezel, robust crown guard and triple-horn strap attachments. With its dynamic shape and sharp angles, the watch has a dial to match its strong, symbolic design. Twelve figures representing the legendary Knights of the Round Table with their swords form a circle replacing traditional hour markers. Each figure is a three-dimensional casting in gold with its details carved by hand. The miniaturization was the work of skilled passionate craftsmen, who produced 12 individually different knights, only 7 mm tall. The precision is best admired through a loupe. In the centre of the scene is a dial in precious grand feu enamel. 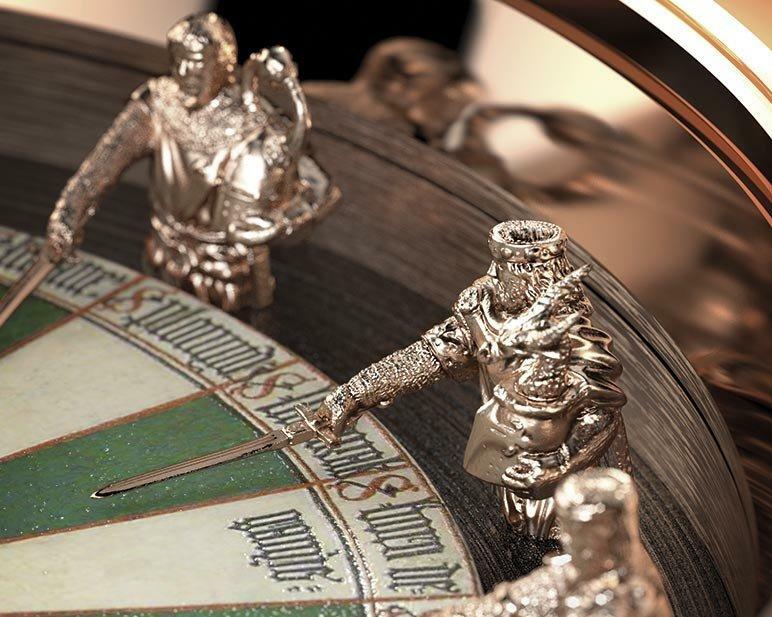 On the back of the watch, the solemn oath, together with a lacquered coat of arms, is engraved in a circle as a tribute to the bravery of the Knights of the Round Table. Among its list of technical achievements is the latest generation of the automatic-winding mechanical movement, the RD821 that displays the hours and minutes. And the movement and the complete watch are stamped with the prestigious Geneva Seal. No prices yet but you can guess we are talking a ransom of Arthurian proportions.